A pirate ship themed park by the seaside. What could be more perfect than that?! Oh, did I mention that it is also beside Mordialloc creek and the boat mooring? 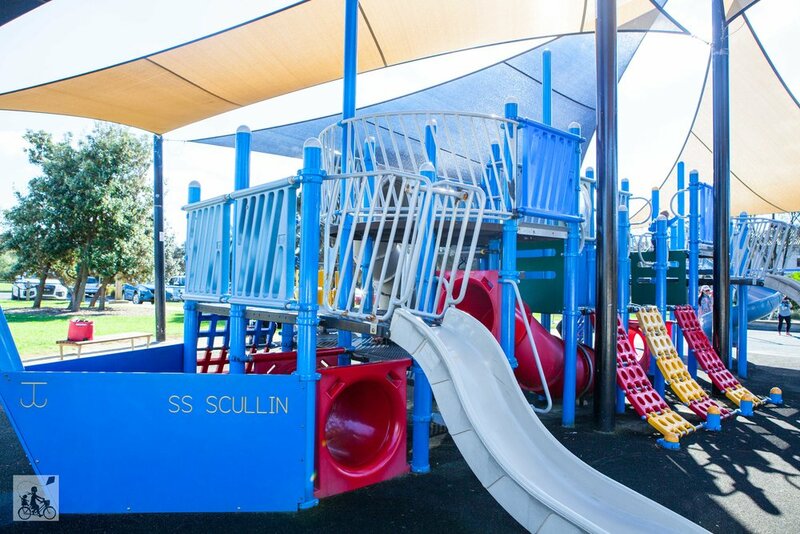 That's right, kids can see boats, water, sand and a fabulous playground, all in one vicinity! Most of the equipment is under shade, perfect for the sunny days. The ground is made of soft matting, ideal for the inevitable falls and for the crawlers! This is a local favourite and can get quite busy in Summer! It is also the location for wonderful family-friendly events held throughout the year - so keep an eye out for the next one! Just a few hundred metres walk to the sandy beach and pier, and a short stroll to the main shopping strip, makes this park prime location. There is also a wonderful restaurant located in the reserve - Windows on The Bay - perfect for a special date. Mamma's special mention: the best spot to eat in the area is Oscars Hangout! It is excellent!